. يقدم شقق أوكس فيلكس خدمات لا غبار عليها وكل أشكال اللياقة وحسن الضيافة اللازمة لإسعاد ضيوفه. يمكن للنزلاء الاستمتاع بالميزات التالية: خدمة الغرف على مدار الساعة, مكتب الاستقبال على مدار الساعة, مرافق مخصصة لذوي الاحتياجات الخاصة, تسجيل وصول/خروج سريع, تخزين الأمتعة أثناء إقامتهم في هذا المكان الرائع. تعكس غرف الفندق البالغ عددها 143 المنتشرة في 40 طوابق جواً من الدفء والألفة.خدمات عصرية مثل شاي مجاني, مناشف, قهوة فورية مجانية, غرفة معيشة منفصلة, تلفزيون بشاشة مسطحة موجودة في بعض الغرف المختارة. يقدم الفندق مجموعة واسعة من وسائل الراحة المتنوعة، كمثل: مركز للياقة البدنية, ساونا, حمام سباحة خارجي, حمام سباحة داخلي, سبا. يحظى فندق شقق أوكس فيلكس بموقع ممتاز وخدمات يصعب منافستها. يرجى العلم أنه سيُفرض على مدفوعات بطاقة الائتمان/المدينة التي تتم مباشرة لفنادق ومنتجعات أوكس رسوم معاملات بطاقات ائتمانية بنسبة 1.5%. نظرًا لمحدودية أماكن انتظار السيارات، يجب حجز الدخول إلى موقف السيارات قبل الوصول. رسوم مكان انتظار السيارة المغطى والمؤمن هو 25 AUD في الليلة. Safe and convenient location. Comfortable and clean except that the pillows are too soft. Fantastic location. Apartment was clean and kitchen had enough equipment to cook if you wanted to. Staff were all friendly and helpful. Amazing views from our apartment balcony. Easy walking distance to absolutely everything. I highly recommend this place for a couple wanting to explore Brisbane. Must say it was difficult at times to leave the room balcony at night because of the beautiful view. It is a few minutes walk to the Brisbane City Botanic Gardens, the bank of Brisbane River, the eateries on Eagle Street and the free ferry pier to the parks on the opposite side of the river bank. Parking in the hotel was convenient at a cost. The location of the apartment is situated near the heart of the city area. The room are very spacious and beds are comfortable. The cleanliness of the room are also above average. When entered the apartment, I was served by very friendly staffs. Overall, I enjoyed my stay at this apartment. The site is so close to city center. The transportation is convenience, like train, bus, ferry all in walking distance. Apartment stylish with all electronic appearance. Eat also very easy to fine arround. Our stay here was the first at Oaks on Felix, but it won't be the last. It is a perfect spot to stay in the city and close to everything you could want. And we had an exceptional room with the best views of the river and the bridge. The staff were really friendly and helpful. Will definitely stay again. The location is good if you wish to be slightly away from the busy Queen Street Mall area . Nevertheless, most of the places are within walking distance , and its also very near to Eagle Street Pier . Probably , would be helpful if there is a signage to or from the Central Station . The apartment is good and clean. Well maintained . Service is good but you have to throw your own garbage ? The maid was supposed to come and clean our apartment after given the time again to the Front Desk , but there was a no show. Its ok with us because most of our time was spent outside the apartment. Kitchen was well equipped . All were clean except the toaster . Taxis are conveniently available along Felix Street . Good location w/i beautiful river view. The room is very clean, plenty of space, and well equipped. We did enjoy our stay here. Good sized apartment in the city. Walking distance to Queen Street mall and Eagle Pier. Don't stay there if you have a car, as it is extra cost and car park is difficult to get in and out if you have a bigger vehicle, Requested high rooms with a view, received level 12 overlooking pub and city not the river. Hotel had thirty floors. Pool is average, Rooms are good but only one AC unit in the lounge. Two Tv's, there is maintenance work on rooms above so some noise travels. Close to all city facilities and restaurants and city cat. I was dissapointed about the fact that we advised to hotel that we wanted to change our booking by 1 day less and there was no room for negotiation to possibly get some funds back (not even possibly offer free parking instead). W notified the hotel through Agoda ahead of time ( a few weeks before). The hotel had already taken full payment in Sept 2017 for our stay inJan 2018. Car parking was $30 per night (expensive in my book) One split system air conditioner for a 2 bedroom apartment in summer left us with hot nights sleep.. I won’t be back.. Stayed here on previous occaison and the reason we came back, but this time the room was very ordinary and dirty. Staff not as pleasant. Probably won't stay again. Needs updating, as is perfect location. Shame really. 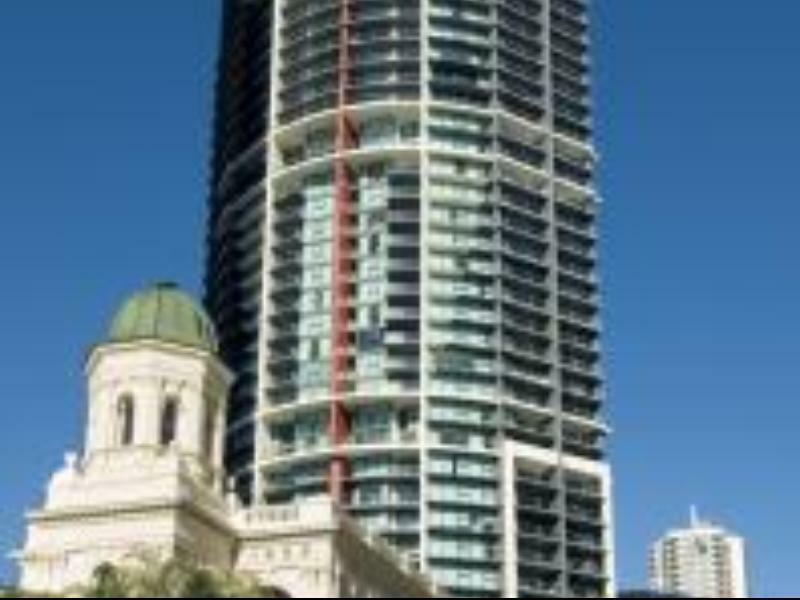 Really great place to stay , had a 2 bedroom apartment beautiful view of brisbane river and bridge , it is really close to resturants , city cat is a few minute walk . Staff was very good , great place to stay . We will definatly stay there again. One bed apartment is great and has evertything you desire for both an overnight or extended stay The executive have fab views from the lounge area and balcony too. Just understand that this is a two bed apartment with the main bedroom locked off and you won't be disappointed. We booked ahead for dinner across the road at Belgian Beer Cafe and that was great too. I really couldn't fault the 1 bedroom executive room 354. It was clean, the staff were great and happy to help with directions etc. There was a fully equipped kitchen and the views od Story Bridge were fabulous. Group dinner out with friends. Location was excellent close to venue. Executive room had view of the Story Bridge and a balcony. Check in was fast. Car parking (at a cost) was available and very convenient. We will stay again.